Two women with the surname of Keogh have the sad distinction of being the first and last female fatalities of the years 1916 to 1921, the insurgent phase of the Irish Revolution. Margaretta Keogh (sometimes, Kehoe)*, a civilian nurse, was gunned down by British soldiers while going to the aid of a wounded volunteer or citizen-soldier of the Irish Republican Army during the battle of the South Dublin Union, one of the more ferocious engagements of the Easter Rising. She was the first women to die in the insurrection, loosing her life on the afternoon of Monday the 24th of April 1916, though many others would follow. Margaret Keogh on the other hand was a committed republican activist, a member of the Cumann na mBan, an all-women revolutionary organisation, who was assassinated in her Dublin home by a “murder squad” of the British Army. She was shot dead on the night of Sunday the 10th of July 1921, the day before a general ceasefire was due to take effect between the forces of the Irish Republic and the British Empire, effectively ending the War of Independence in the Twenty-Six Counties (though not in the north-eastern Six Counties). The tragedy of their deaths illustrated the brutal nature of the conflict between Britain and Ireland at the start of the 20th century, brought about by the former’s refusal to countenance the latter’s demand for independence. Margaretta Keogh was born and raised in Orchard, Leighlinbridge, County Carlow, and was related to Captain Myles Keogh of the US Seventh Calvary, one of several Irish officers serving with the United States Army who died alongside George Armstrong Custer in the Battle of the Little Bighorn, an 1886 event better known as “Custer’s Last Stand.” At the time of the Easter Rising she was working as a nurse at the South Dublin Union (SDU) on James’s Street, a cluster of mid-19th century workhouses, infirmaries and churches for the capital’s permanently destitute or ill. Over 3200 men and women lived and worked in the complex of mismatched buildings, streets, alleys and courtyards which stretched out over some 50 acres of land on the south-western outskirts of the city-centre making it something of a miniature, self-contained town (part of the site is now given over to the modern Saint James’ Hospital). Unfortunately its location was of strategic importance to the insurrection as it covered the western approaches to the capital and the proposed headquarters of the Provisional Government of the Irish Republic in the GPO building on O’Connell Street. Consequently some 120 volunteers under Commandant Éamonn Ceannt of the 4th Battalion, Dublin Brigade, of the newly formed Irish Republican Army, garrisoned themselves on the site, barricading local approaches and several structures on the grounds, including the Nurses’ Home, the Female Chronic Hospital, the Protestant Hospital, and the Acute Hospital. However this number was less than a fifth of those originally detailed to the operation due to confused and contradictory orders issued in the days proceeding the uprising, which was to dictate the course of the coming battle. “About 1 p.m. I heard rifle fire in the direction of Nos. 2 and 3 hospitals where I was informed that other detachments of Volunteers had taken up positions. About 1.30 p.m. I heard from a member of the Staff that Nurse Keogh had been shot. While rushing down stairs to take in her patients who were out in the yard, I was also informed that she bad been shot through a glass door by British forces. Linked to the above, a detailed list of men and women classed as “Killed in Action“, and complied by Captain R. Henderson of the Command Training Depot, Irish Defence Forces, for the BMH in 1957, specifically includes “Nurse Keogh” among the fatalities belonging to the SDU Garrison. “When the British fire began to play on the Volunteer Post in the South Dublin Union, on Easter Monday, 1916, a Volunteer fell wounded outside the door of the hospital. Immediately a nurse rushed out to his assistance and she was bent over the wounded man she herself was fired upon and fell dead. This outrage is all the more glaring, as he was in uniform, which must have been distinctly seen. Eamon Ceannt addressed the men afterwards, and declared that Nurse Keogh was the First Martyr and asked the Volunteers to so remember her. This description was recorded in “The Last Post”, a commemorative document published by the National Graves Association (NGA), featuring detailed if occasionally flawed records of the republican dead of the revolutionary period. The addition of a civilian, non-combatant was relatively unusual and gives considerable credence to the claims that Keogh aided the Republican Army forces in the South Dublin Union, and was killed by British soldiers during the first hours of the fighting. The exact manner of her death may have been confused in later accounts, but it seems likely that she was going to the aid of an injured Dan MacCarthy when she was shot dead at a doorway leading out of the Acute Hospital or Hospital 3 of the SDU. The death of Margaret Keogh of the Cumann na mBan (CnamB) in the summer of 1921 came in somewhat different circumstances. She was born and raised in Dublin city, becoming active with Conradh na Gaeilge, the Irish language movement, and the Irish Clerical Workers Union in the five years after the Easter Rising of 1916. 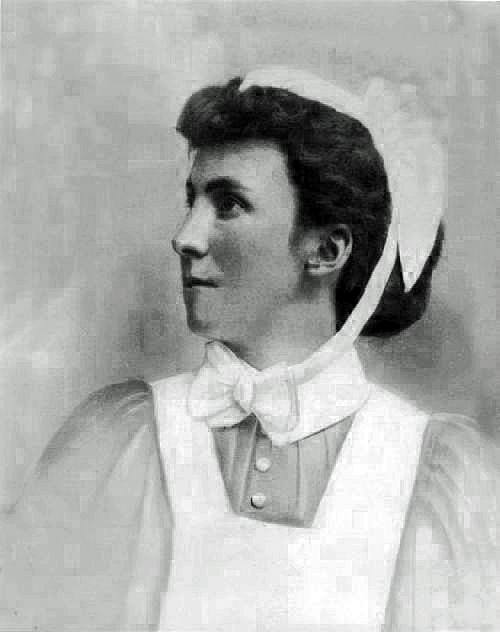 In between campaigning for the rights of Irish-speakers, which led to her arrest and temporary detention (for answering in Irish to questions put to her in English, something still occurring in Ireland nearly a century later), and workers’ rights, she was employed as a printer’s assistant with Healy & Co. Printworks of Dame Street. However it was her clandestine membership of the CnamB that led to her untimely death at the age of nineteen in the final hours of the pre-truce War of Independence. It was just after 11pm on the 10th of July 1921, the day before an agreed Irish-British cessation of hostilities, when Margaret heard a banging on the front door of her family home at No. 20 Stella Gardens, Irishtown, a working class area in the eastern part of Dublin city. Fearing another raid by the UK military and paramilitary forces, then common across the capital, she left her bed, going downstairs to open the front door of the house. Unable to see anyone in the dark she was retreating inside when the noise of a single gunshot rang out. The force of the bullet from the hidden assailant threw Margaret backwards and she fell mortally wounded to the floor of the hallway. The next day, an hour after the ceasefire came into effect at noon, she died in Sir Patrick Dun’s Hospital on Grand Canal Street. Outside the people of Ireland were celebrating the truce and what the general public viewed as a victory over the British by the Irish Republican Army, while inside her family and friends grieved. The killers of Margaret Keogh were almost certainly members of a “murder squad” operating with the 2nd Battalion of the Worcestershire Regiment, British Army, headquartered in Portobello Barracks since early 1919. The unit was known to be thirsting for revenge after the death of Second Lieutenant Alfred Donald Hugh Breeze, one of its intelligence officers, during an armed encounter with volunteers of F Company, 6th Battalion of the Irish Republican Army, on June 19th, 1921, at Murphystown, Sandyford. From that date onwards the Worcestershire troops stepped up their campaign of terror south of the River Liffey, engaging in destructive raids of homes and businesses. On July 7th they were joined by the regiment’s 4th Battalion from Glasgow, where it had led the suppression of protesting dockers supporting a national miners strike in Britain. This unit had made a great show of marching through the streets of Dublin to their camp in the Phoenix Park, clearly spoiling for a fight. Margaret Keogh’s funeral took place at Glasnevin Cemetery in Dublin on the 14th July where she was buried with full military honours, her tricolour-draped coffin carried by uniformed members of Cumann na mBan and many local republicans. As we remember the centenary of the Easter Rising of 1916 and with it the commencement of the republican revolution, we should also remember all those individuals who gave their lives for the Irish democratic freedoms that a majority of the people of the island of Ireland enjoy today. *The name of the nurse is recorded variously as Margaretta/Margaret Keogh/Kehoe. However the combination Margaretta Keogh seems certain to be the original form.